You have to love a good old-fashioned gas price war. That is what has been going on (at least in Central Texas) between Wal-Mart and H.E.B. First, they have both been consistently trading off as the lowest priced gas (according to my favorite smartphone app – GasBuddy.) Now, they have brought out the big guns in this battle for customers – discount cards. Sure, both these combatants are hoping that this loss-leader will get you to change your habit (or retain it) trusting that we are creatures of habit. Long after the promotion runs out, the theory is that we will continue to shop where we are comfortable. And heck, I am sure they are counting on recouping some of the discount from people losing cards, forgetting they have money on them, or just waiting until the promotion expires to use them. Regardless of their marketing goals – it is a GREAT promotion to take advantage of. 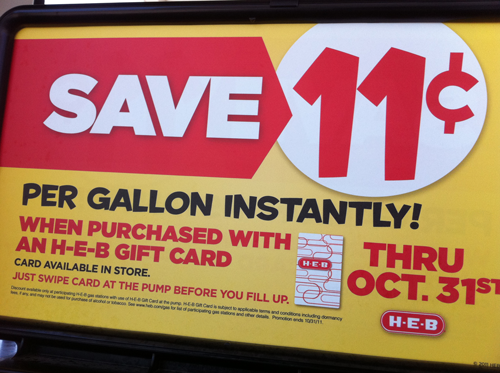 Be smart – use the card – don’t lose the card, and you will be rewarded with lower priced gasoline. If you are like me, none of these promotions will affect where I purchase gas after the promotion ends. I know that all the gas is the same and that the company that gets me the gas cheapest & most conveniently will get my business. PreviousFinally! I have found the BEST CHICKEN FRIED STEAK!